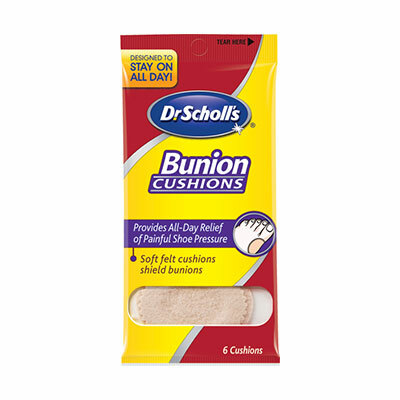 You are buying the Dr. Scholl's Bunion Cushions With ComfortPlus Pack of 6, Model #12288. ADW Diabetes offers a wide range of Dr. Scholl's products including diabetic socks, specialty insoles, and foot care products geared towards achieving better foot health. ADW Diabetes offers all of our Dr. Scholl's products in singles and bulk packs for your convenience. Trust ADW Diabetes for low prices and superior service. Dr. Scholl's Bunion Cushions With ComfortPlus Pack of 6 Model #12288 feature two layers of soft felt with cushioning to provide all-day relief from painful shoe pressure. Plus, the self-stick adhesive is waterproof.